In honor of September’s official birthstone, we aim our spotlight on the “Blue Giant of the Orient,” a gem that’s not only the largest faceted blue sapphire in the world at 486.52 carats, but also one that is shrouded in mystery. Very little is known about the cornflower-hued cushion-cut gemstone as it was out of the public eye for nearly 100 years. Discovered in Sri Lanka in 1907 and sold to an anonymous American collector that same year, the intense medium-blue gemstone remained quietly under the radar until May 2004, when it unexpectedly appeared in a Christie’s Magnificent Jewels auction catalog. Curiously, the amazing gem, which was billed by Christie's as the largest faceted sapphire ever to be offered at auction, failed to entice any bidders at the Geneva event even though it had been estimated to sell for $1 million to $1.5 million — a relative bargain by today’s standards. 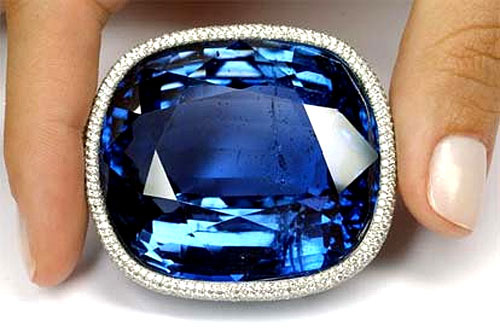 Shortly after the auction, however, Christie’s was able to strike a deal with an anonymous British buyer who paid $1 million for the world-famous sapphire. The gem, which displays full color saturation, is set in a platinum brooch with a pavé-set diamond surround. After the Christie’s event, the Blue Giant of the Orient vanished from public view once again and hasn’t been seen since. The very early history of the Blue Giant was well documented. An August 1907 story in the Sri Lankan Morning Leader announced that a "moonstone sapphire" worth £7,000 ($10,903) had been mined in Sri Lanka’s Ratnapura district. A leading exporter, O.L.M. Macan Marker & Co., purchased the rough sapphire, which weighed more than 600 carats. Local cutters worked the rough stone into a finished gem weighing 466 carats. Some experts believe that the 20-carat discrepancy between the weights noted by the 1907 newspaper report and that of the 2004 Christie’s auction catalog reflected either an error in the accuracy of the weighing equipment of the time or a simple recording error. The newspaper noted that the gem’s finished size was 2 1/2 inches long, 1 ¾ inches wide and ¾ of an inch its thickest point. 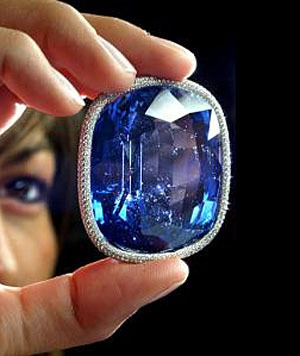 Interestingly, the world’s first-, second- and third-largest faceted blue sapphires are all of Sri Lankan origin. 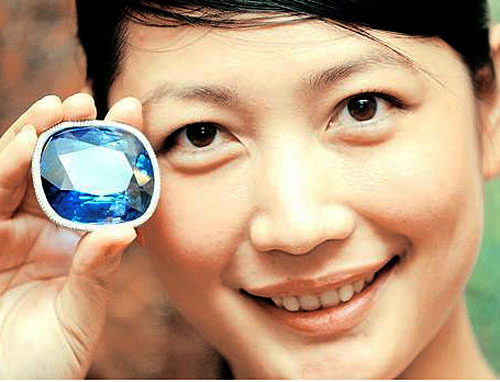 These are the Blue Giant of the Orient, the 422.99-carat Logan Blue Sapphire and the 400-carat Blue Belle of the Orient. Blue sapphire, which is a member of the corundum family, gets its striking color from the displacement of aluminum atoms with those of titanium and iron in the gem’s crystal lattice structure. It is one of the most coveted and valuable of all gemstone varieties. Russian President Vladimir Putin is on the hot seat for allegedly swiping New England Patriots’ owner Robert Kraft’s $25,000 diamond-encrusted 2005 Super Bowl ring. Although the incident took place eight years ago during a St. Petersburg business summit, Sen. John McCain stoked the issue on Tuesday when he suggested on CNN that the Russian delegation coming to Washington later this week to talk about Syria should return the prized ring. "I was thinking this morning the worst thing you could do in the Old West was to steal another man's horse,” McCain told CNN. “I would think in New England the worst thing you can do is steal another man's Super Bowl ring." 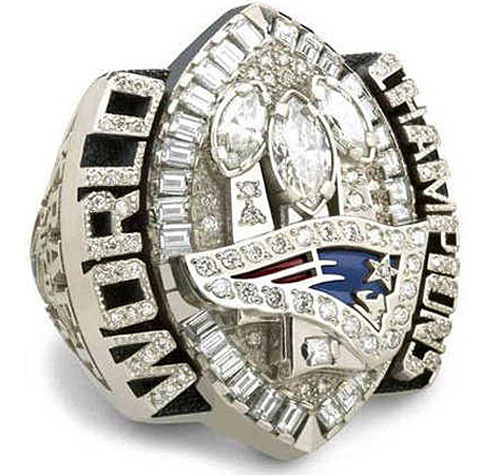 The 14-karat white gold ring commemorating the Patriots’ 2005 Super Bowl XXXIX victory is adorned with 124 diamonds, the most of any of the 46 Super Bowl rings. The diamond total weight is 4.94 carats and the oversize ring tips the scales at about a quarter pound. 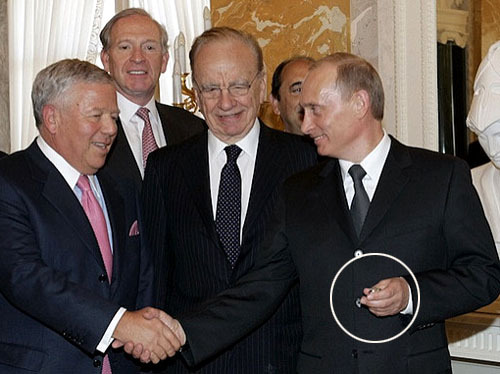 Videos and still photographs of the 2005 St. Petersburg event show Putin holding and admiring Kraft’s ring during a photo op and even trying it on. What happened next is a matter of interpretation. Speaking at a New York gala in June, Kraft recounted, "I took out the ring and showed it to [Putin], and he put it on and he goes, 'I can kill someone with this ring.' I put my hand out and he put it in his pocket, and three KGB guys got around him and walked out." The Patriots’ owner said that back in 2005 he was pressured by the Bush White House to avoid an uncomfortable diplomatic situation by affirming that the Super Bowl ring was a gift for Putin. Kraft issued a statement at the time saying he decided to gift the ring as a symbol of the respect and admiration he had for the Russian people and the leadership of President Putin. Putin spokesperson Dmitry Peskov, who was present during the alleged pocketing, saw the incident much differently. In June, he said, “What Mr. Kraft is saying now is weird. 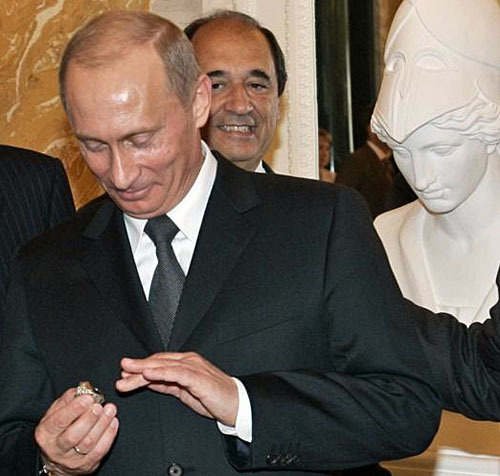 I was standing 20 centimeters away from him and Mr. Putin, and saw and heard how Mr. Kraft gave this ring as a gift." 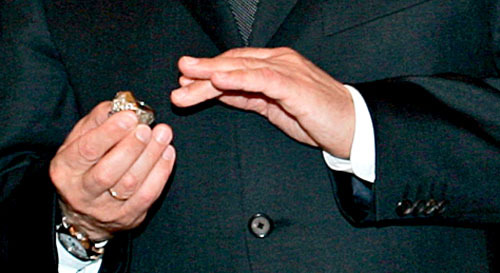 Kraft’s Super Bowl ring was reportedly handed over to the Kremlin library, where many gifts of the state reside. Curiously, when asked about the possibility of returning the Super Bowl ring, Putin at first had trouble remembering the incident and then offered to have a replacement ring made. “You know, I don’t remember either Mr. Kraft, or the ring,” Putin said, according to Russia’s Interfax news agency. “This would be the smartest solution partners can ever achieve while tackling such a complicated international problem,” Putin sarcastically added. Why he is unwilling or unable to return the original Super Bowl ring is still a mystery. It looks like Sotheby’s will be celebrating its 40th year in Asia with not one — but two — record-breaking diamonds at its Hong Kong Magnificent Jewels and Jadeite auction October 7. The as-yet-unnamed D-color flawless 118.28-carat oval diamond carries a pre-sale estimate of $28 million to $35 million. If it achieves only the low estimate, it will break the current record for the highest price ever paid at auction for a white diamond. The current record holder is the Winston Legacy, a 101.73-carat D-Flawless pear-shape gem that was sold at Christie’s in May for $26.7 million. The Premier Blue carries a pre-sale estimate of $19 million. If the internally flawless 7.59-carat gem is sold for that amount, it will establish a new auction record at $2.5 million per carat, the highest per-carat price ever paid for any diamond. The unnamed white diamond was revealed at a Manhattan media event yesterday. A newcomer to the auction scene, the diamond was discovered as a 299-carat rough in an undisclosed southern African nation in 2011. The resulting 118.28-carat finished product is a sight to behold. 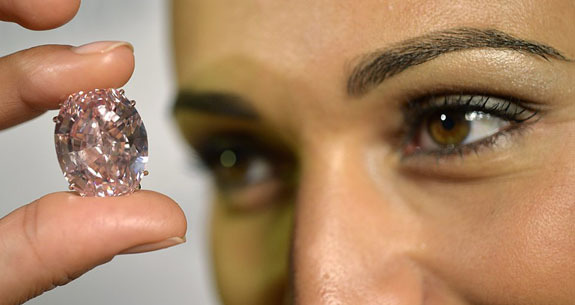 Sotheby's calls it the greatest white diamond to be offered at auction in terms of size, quality, polish and color. The auction winner will also get the privilege of naming the diamond. “We have made a concerted effort to make this a wonderful sale to celebrate Sotheby’s 40 years in Asia,” Chin Yeow Quek, the chairman of Sotheby’s jewelry division in Asia, told JCKonline.com. Quek added that he hopes the October sale — bolstered by its two headliners — will set a record for the largest jewelry auction ever in terms of total sales. Three other white diamonds weighing more than 100 carats have been auctioned by Sotheby's — in 1990, 1993 and 1995. 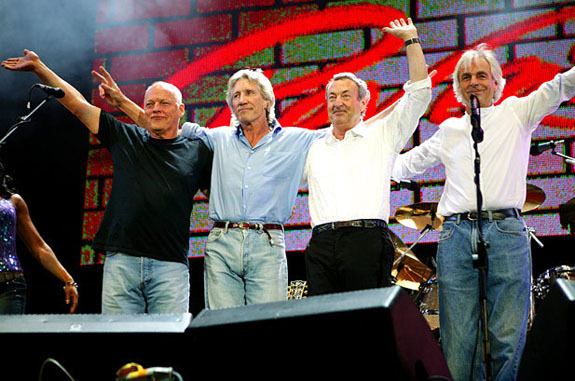 A founding member of Pink Floyd, Barrett was the group’s lead vocalist, lead guitarist and primary songwriter during the band's early years. He is also credited with naming the band. It wasn't long, however, before mental illness and drug abuse took its toll. His behavior became erratic. Concertgoers reported that he would sometimes get on stage and not play a single note. Other times he would play the same note over and over. His stint with Pink Floyd lasted only three years and he was forced to leave the band in 1968. 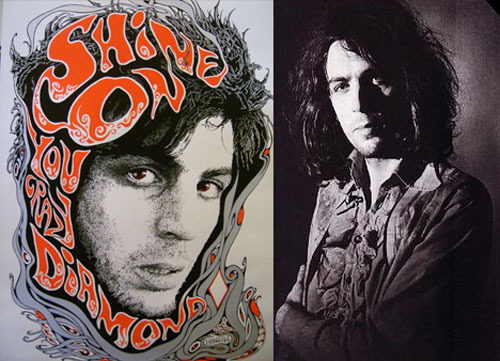 Running a shade over 26 minutes, “Shine On You Crazy Diamond” was originally intended to fill the first side of the concept album, Wish You Were Here. Ultimately the band members decided it was best to split the song in half and allow it to bookend the album. Wish You Were Here turned out to be a huge commercial success with more than 13 million copies sold. Rolling Stone magazine anointed it as one of the "500 Greatest Albums of All Time." Although the original song runs 26+ minutes, we’ve found an abbreviated clip that focuses on the powerful lyrics that tie into our Music Friday theme. And it runs just 2:41. Enjoy. Written by Roger Waters, David Jon Gilmour and Rick Wright. Performed by Pink Floyd. Scarlett Johansson’s secret engagement to Frenchman Romain Dauriac is a secret no longer. Eagle-eyed photographers spotted a vintage Art Deco-style diamond ring on her left hand while she walked the red carpet at the 2013 Venice International Film Festival last week and the actress was forced to come clean. The glamorous 28-year-old, who was in Venice to promote her new film, Under the Skin, confirmed through a spokesperson that the dazzling three-stone ring she wore at the event was, in fact, an engagement ring. Johansson accepted a marriage proposal from Dauriac, a 31-year-old French journalist, about a month ago. The unique Art Deco design is unlike anything we’ve seen recently from Hollywood’s elite. Johansson’s ring features a large round center diamond flanked by two slightly smaller round diamonds in a rectangular white-metal setting that’s likely platinum. The center stone seems to sit slightly higher than the others and the setting glitters with neat rows of tiny accent diamonds. The actress reportedly had attempted to keep the engagement ring out of sight during her red carpet walk, spinning the band so the diamonds faced away from the cameras. Of the dozens of photographers working the Venice film festival, only a few were able to see the ring clearly. Apparently she had a change of heart. Johansson was previously married to actor Ryan Reynolds. In May 2008, Reynolds proposed to her with a traditional round diamond set on a very simple yellow gold band. The couple divorced in 2011. Confusing a diamond stud earring for a tasty snack, a mischievous six-month-old pet cockerel named Sarah (despite being a male) pecked off the flashy bauble from his owner’s earlobe and swallowed it down. Now it looks as if bird lover Claire Lennon might have to wait eight years to get it back. Lennon, a resident of Berkshire in the U.K., told the Daily Mirror that the pet bird was happily perched on her shoulder when she suddenly felt a sharp pain. The bird had pulled out the earring and in an instant it was gone. 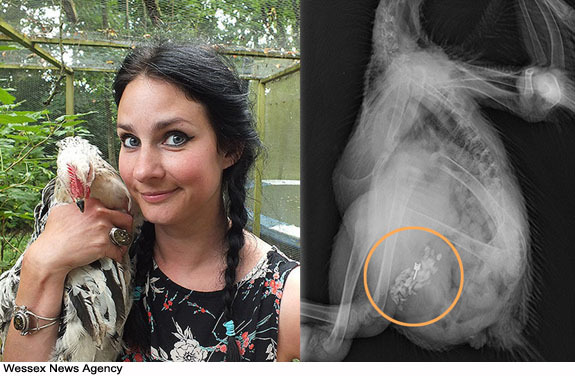 X-rays confirmed that the earring was lodged in the cockerel’s gizzard and unlikely to pass via natural methods, according to the family’s veterinarian. The diamond stud is now a permanent part of Sarah’s anatomy because the owner will not consider life-threatening surgery on the family pet. The final option is waiting for nature to take its course. 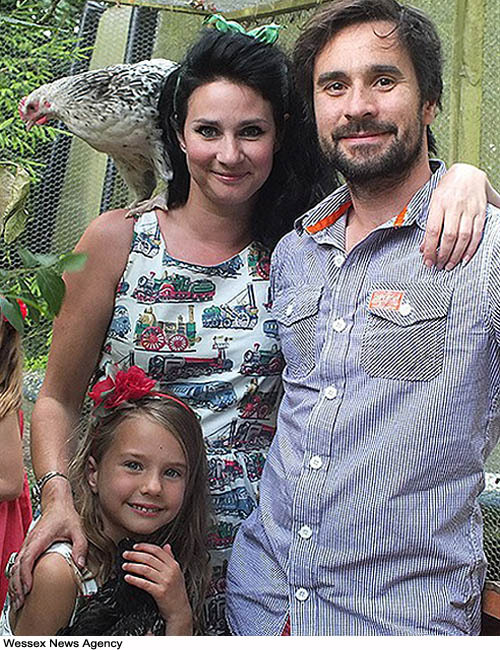 Sarah is likely to live for eight years, so Lennon and her family are going to patiently wait for the bird to naturally die of old age. By then, the veterinarian said, the white gold setting is likely to be ground down by the digestive powers of bird’s gizzard, while the diamond — the world’s hardest material — will remain intact. The consumed diamond stud is one of a pair that Lennon received from her partner, Adam. It’s valued at about $500, making Sarah one of the most valuable cockerels in Britain. "We're keeping a close eye on him to make sure he doesn't get caught, carried off and eaten by a fox, or the diamond will be gone forever,” Lennon said. 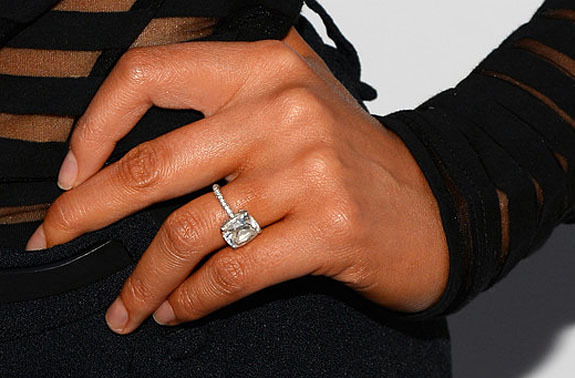 The colossal 20-carat diamond engagement ring that came to symbolize the ill-fated 2011 romance between jilted NBA star Kris Humphries and TV reality star Kim Kardashian will be hitting the auction block at Christie’s “Bright and Beautiful” event in New York on October 15. Humphries won the ring this spring as part of a divorce settlement stemming from the couple’s contentious 72-day marriage. Although the auction house says the ring is the “property of a gentleman” and doesn’t list Humphries as the owner, the Christie’s ring bears an uncanny resemblance to the Kardashian ring. They are virtually identical in terms of total weight, dimensions and design. At the time of her engagement to Humphries in the spring of 2011, the Keeping Up With The Kardashians star told People magazine that her ring featured a 16.5-carat emerald-cut center diamond flanked by a pair of trapezoid-cut side stones weighing 2 carats each for a total of 20.5 carats. "[Designer Lorraine Schwartz] always listened to what I would want and the shapes I love," Kardashian told People. "I had said I loved an emerald cut." 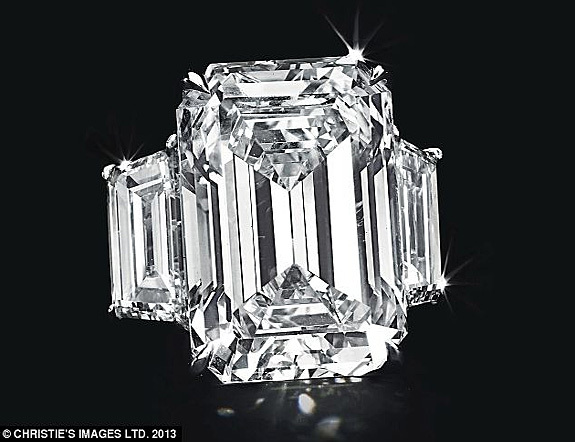 A Christie’s press release described its ring as an "impressive rectangular-cut, I-color diamond ring of 16.21 carats, by Lorraine Schwartz." The center stone is flanked by two 1.80-carat trapezoid-cut diamonds for a total of 19.81 carats. 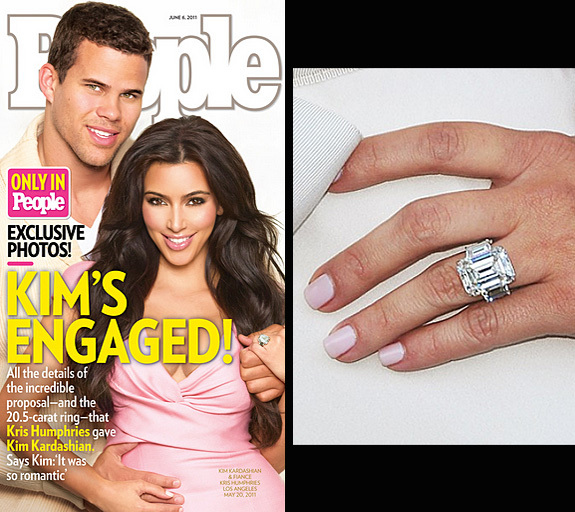 The only major disparity between the Kardashian ring and the Christie’s ring is the reported value. A Kardashian family “insider” told the tabloids in 2011 that Humphries “got a great deal” when he paid $2 million for the designer ring. Christie’s puts the estimated value of the anonymous owner’s ring at only $300,000 to $500,000, with a portion of the proceeds going to an unnamed charity. Some are now speculating that the Kardashian publicity machine may have floated an exaggerated $2 million price tag to support the reality show’s story line. In 2012, Kardashian began a relationship with rapper Kanye West and gave birth to their daughter North West in June of 2013. 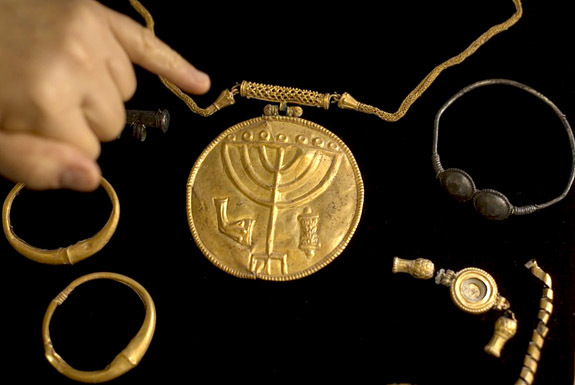 Archaeologists working at the foot of Jerusalem’s Temple Mount — a holy site for three world religions — unearthed a 1,400-year-old trove of jewelry and gold coins that’s being described as "a breathtaking, once-in-a-lifetime discovery." 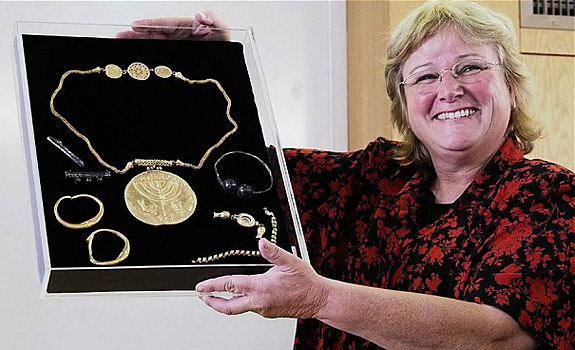 Lead archaeologist Dr. Eilat Mazar of the Hebrew University of Jerusalem showed off her team’s most impressive find during a press conference on Monday. 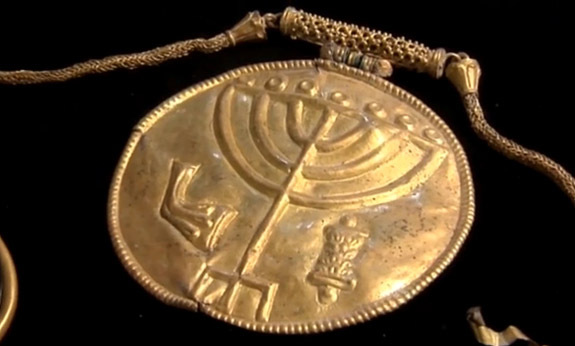 It was a four-inch-wide gold medallion etched with images of a seven-branched candelabrum (menorah), a ram’s horn (shofar) and a Torah scroll. Despite being buried for 14 centuries, the piece was in pristine condition. Mazar's team also revealed Byzantine-era gold and silver jewelry, as well as 36 gold coins depicting the images of emperors ranging across a 250-year span from Constantine II to Mauricius. “I have never found so much gold in my life! I was frozen. It was unexpected,” Dr. Mazar told the Times of Israel. Mazar and her team suspect that the treasures were buried and abandoned by their Jewish owners during the Persian conquest of Jerusalem in 614. Welcome to Music Friday when we feature toe-tapping tunes with jewelry, gemstones or precious metals in the lyrics or title. Today we bring you Elvis Presley's cover of Ray Charles' classic 1959 song, “What’d I Say.” Presley famously performed the song in a sizzling dance number with co-star Ann-Margret for the 1964 hit movie, Viva Las Vegas. Although “What’d I Say” is widely acknowledged as one of the most influential songs in rock and roll history, Charles never intended to write it. He and his orchestra improvised it in 1958 when they had completed their play list and still had time remaining in their show. “What’d I Say” would include elements of rhythm and blues and boogie-woogie in a fun call-and-response repartee with his audience and the band. The improvised song was so well received that Charles decided to record it in 1959. “What’d I Say” would become Charles’ first gold record, and for the rest of his career, the talented singer/songwriter/musician would close every concert with the song. 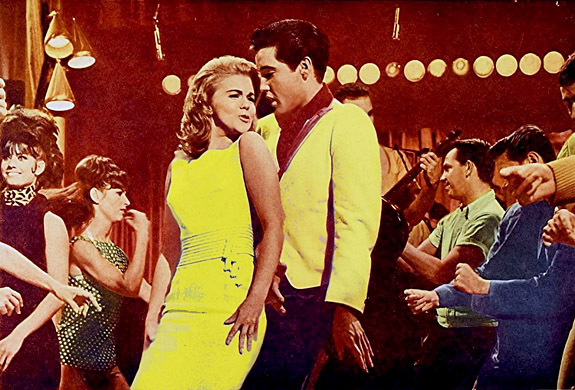 Check out Presley and Ann-Margret in the memorable dance scene from Viva Las Vegas. The choreography is vintage 1964, and awesome. The lyrics to “What’d I Say” are below if you’d like to sing along. Written by Ray Charles. Performed by Elvis Presley. Baby, it's all right, Oh yeah! Seven-time Grammy Award winner John Legend exchanged vows with Sports Illustrated supermodel Chrissy Teigen in an intimate wedding ceremony at Lake Como, Italy, on Saturday. Lake Como is the place they first fell in love. The model looked ravishing in a Vera Wang gown, and sparkling on her left hand was the breathtaking cushion-cut diamond engagement ring that made headlines when Legend gave it to her during the holiday season of 2011. The cushion cut is considered a “fancy” diamond shape and is often selected as a progressive alternative to the more common oval- or princess-cut diamond. It’s essentially a “pillow” shape — a square outline with softened, rounded corners. 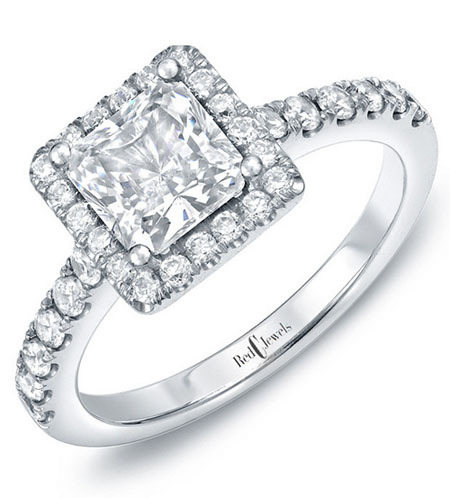 The modern cushion cut is based on an antique cushion cut that can trace its history to the 1830s. 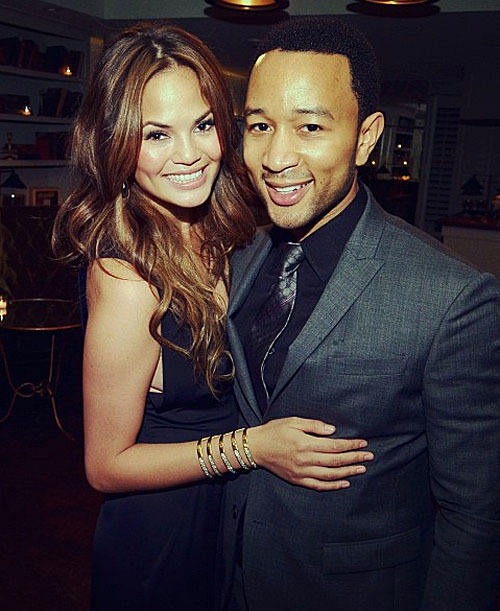 Teigen told People in May that her talented 34-year-old fiancé would perform “All of Me” at the wedding — a brand new song that was written especially for her. The song is featured on his latest album, Love in the Future. In January of this year, Teigen half-joked to the New York Daily News during the Sports Illustrated swimsuit issue launch party that Legend had until the end of the year to tie the knot, or she was going to “hit the road.” Seems like Legend got the message. 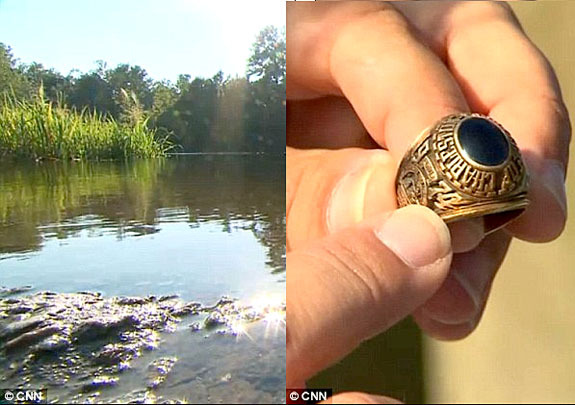 A 61-year-old cancer patient enjoyed an emotional, tearful reunion with his beloved college class ring — 39 years after losing it — thanks to the selfless efforts of a recreational fossil hunter who rescued the cherished keepsake from the bottom of the Cooper River in South Carolina. 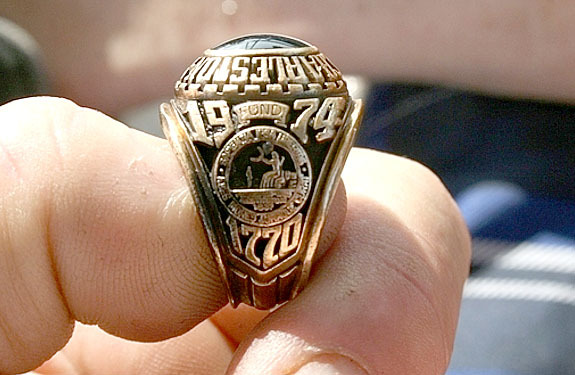 Determined to find the owner of the large men’s ring, Tovin contacted the college’s alumni association and learned that only two people in the 1974 graduating class had those initials, and one was a woman. The “RLP” on this ring had to be the initials of Robert LeVaughn Phillips, so Tovin used his social media skills to track down Robert’s son, Eric. The younger Phillips told Tovin that his dad was battling cancer and was still in the hospital recovering from brain surgery. Despite his dad’s fragile condition, the young Phillips arranged for Tovin to visit his dad’s hospital room in Charleston to make the special presentation. On bended knee, Tovin opened a box that contained the ring Phillips hadn’t seen in 39 years. Phillips wept as he recounted that the ring was the last gift his mom gave him before she died of pancreatic cancer. He told a reporter that he believed his mom’s spirit may have played a role in the return of the ring that symbolized all that he was able to accomplish in his youth despite growing up without a father in his life. He had graduated from the College of Charleston with a degree in business administration. On a lighter note, Phillips revealed to Tovin and a CNN reporter how he lost the ring in the first place. He had been enjoying a day of boating with his future wife, Nancy, on the Cooper River when his two-week-old class ring got tangled in the pop-top of a beer can he had just opened. When he shook his hand to free the pop-top, the poorly sized ring shot off his finger and went flying into the water. "No matter how much time he has with us, we'll always have that ring. And it will always signify a good season of our life and a good memory of our father, and the fact that he got to share in it before he left us," Eric Phillips told CNN. Inspired by the juxtaposition of human mortality with the timelessness of gemstones, Peruvian artist and master carver Luis Alberto Quispe Aparicio will debut an ethereal collection of 15 gem skulls October 18 at the world headquarters of the Gemological Institute of America (GIA) in Carlsbad, Calif. Titled Faces of Eternity, the exhibit will feature intricately carved and polished life-size skulls made from unusual gem crystals and ornamental rock. 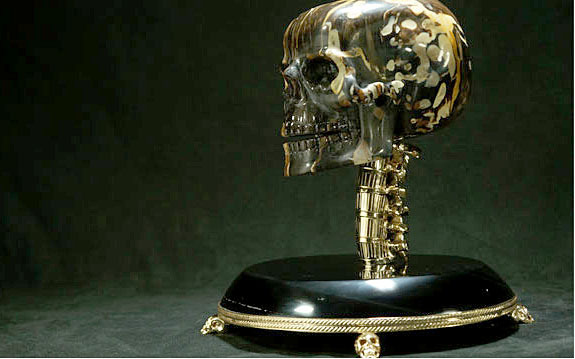 Impressively, the artist designed and created his complete 26-skull collection during a one-year period. The 11 skulls not included in the GIA exhibit are now part of private collections. Highlights of the exhibit include “Chocolate with Peanut Butter” (top photo) featuring petrified palm wood agate from Australia, vermeil and obsidian; “Top Hat Gentle-Skull” featuring rock crystal quartz from Madagascar, snowflake obsidian and vermeil; and “Everlasting Youth” featuring aquamarine from Mozambique, vermeil and rock crystal quartz. The Faces of Eternity exhibit will be on display at the GIA from October 18, 2013, through April 2014. 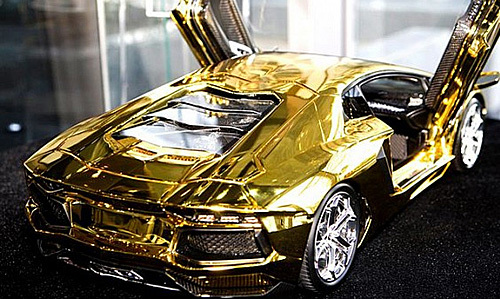 Fashioned from a half-ton block of pure gold and encrusted with 700 diamonds, this scale model of the Lamborghini Aventador is expected to fetch $7.5 million at auction, making it the world’s most expensive model car. 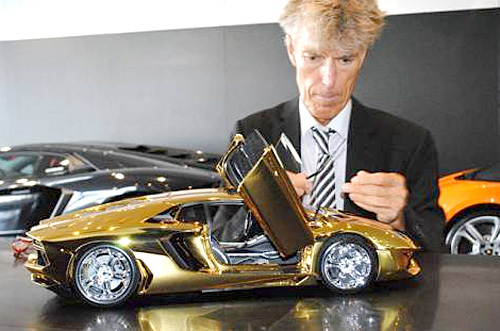 Designed in 1:8 scale by former Mercedes-Benz engineer and German model maker Robert Gulpen, the diminutive 24-inch-long supercar is 14 times more costly than its full-size, seven-speed, blazing-fast counterpart. About $2.6 million of the total value can be attributed directly to the precious metals and gemstones used in the design. 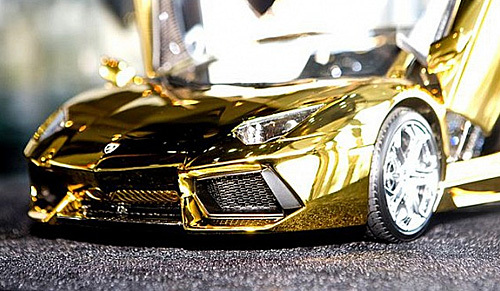 The finished model contains more than 55 pounds of pure gold. 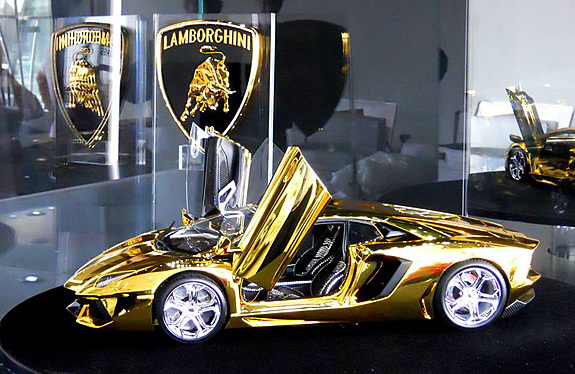 The wheel coverings are fabricated in pure platinum, and the Lamborghini logo is designed in gold, platinum and diamonds. 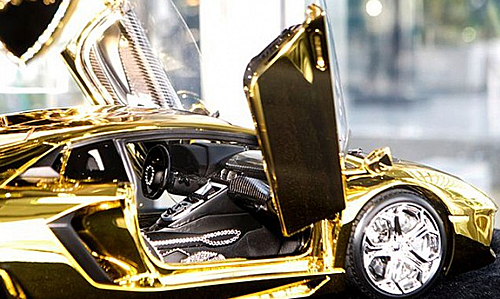 The car’s two seats and steering wheel are trimmed with 700 fine diamonds. Diamonds are also used to accent the headlights and taillights. Gulpen claims that it took one-and-a-half years and a team of 10 engineers to make the model. The actual full-size Lamborghini Aventador LP700-4 has a seven-speed transmission, V12 engine, and goes from 0 to 60 mph in 2.9 seconds. A near-exact prototype of Gulpen’s solid gold model is currently on display in Dubai, famously known as the “City of Gold.” The prototype, which is secured in a bullet-proof-glass case, mimics the final product, but is made of less valuable materials. The designer will be customizing the actual pure-gold version for the eventual owner. 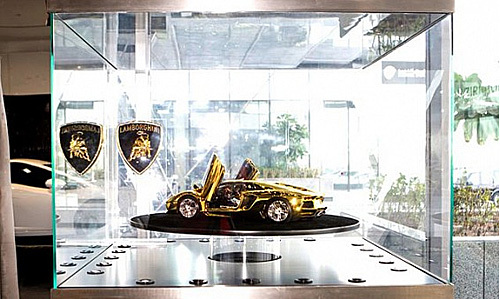 Gulpen said the golden Lamborghini will secure three entries in the Guinness Book of World Records: most expensive model car, most secure showcase and the most luxurious logo. He also noted that $650,000 of the purchase price would go to charity. Welcome to our musical Flashback Friday when we bring you “oldies but goodies” with jewelry, gemstones or precious metals in the title or lyrics. Today we present the squeaky clean Bay City Rollers singing their 1975 version of The Four Seasons’ “Bye, Bye, Baby,” a tune that includes a key reference to a wedding ring. Formed in 1966 as The Saxons, the Edinburgh, Scotland-based Bay City Rollers got their catchier name when one of the band members threw a dart at a map of the U.S. and it apparently landed “near” Bay City, Mich. 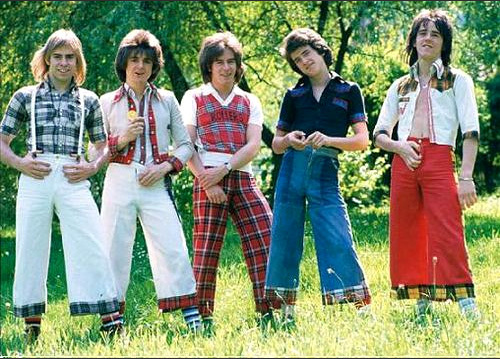 The Bay City Rollers ran off a string of chart-toppers in the mid-1970s, including 1975’s “Bye, Bye, Baby,” which sold more than a million copies and was the U.K.’s biggest hit of the year. At the peak of their popularity, the Scottish teen heartthrobs — famous for wearing calf-length tartan trousers — were heralded as “the biggest group since the Beatles." Ten years earlier, “Bye, Bye, Baby” was a hit for The Four Seasons, with Frankie Valli on lead vocals. The song reached #12 on the Billboard Hot 100 chart and continues to be performed by the 79-year-old Valli, who is still touring. We hope you enjoy the video of the Bay City Rollers singing “Bye, Bye, Baby.” The lyrics are below if you’d like to sing along. Written by Bob Crewe and Bob Gaudio. Performed by the Bay City Rollers. Just gotta tell her anyway. Bye bye baby, baby goodbye. Bye baby, baby bye bye. Tallying more than a million views in four days, Matthew Gencarella’s amazing tandem wakeboard marriage proposal video is one of the coolest of all time. While zipping across a lake on a tandem wakeboard, the former gymnast demonstrated tremendous agility — and romantic creativity — by lowering himself to one knee and proposing to his girlfriend, Brynn Hathaway. In the video one can see the surprised Hathaway nodding her head and saying, “Yes.” At the moment she accepted his proposal, the couple simultaneously released the tow bar and joyously launched themselves backwards into Lake Hayden. A videographer in the side boat captured the precious moment. Gencarella noted that Lake Hayden, near their hometown of Couer d’Alene, Idaho, occupies a special place in couple’s hearts. If you’re wondering what happened to the ring, it turns out that Gencarella was clever enough to save that part of the proposal for the surer footing of the boat deck. As Gencarella placed the diamond engagement ring on his fiancée’s finger, the look on Hathaway’s face is heartwarming and priceless. The must-see video is titled “The Proposal.” Click below to share the experience. It’s official. American pop star Kelly Clarkson has been stymied in her bid to claim the 200-year-old turquoise ring once owned by famed British novelist Jane Austen. Clarkson — an avid Austen fan — had won the ring last summer at a Sotheby’s auction in London, having outbid a cadre of competitors, including the Jane Austen’s House Museum. Clarkson’s winning bid was $235,000 — more than five times the auction house’s high estimate. But instead of allowing Clarkson to take the ring back to the U.S., British authorities unexpectedly declared the ring a “national treasure” and temporarily blocked its export. If a British patron could match Clarkson’s winning bid before September 30, the singer would have to forfeit the ring so it could stay in the U.K. Seizing the opportunity to get back into the game, Jane Austen’s House Museum launched an aggressive fundraising appeal through its website and Facebook page. Donations from around the world flooded into the “Bring the Ring Home” campaign, and within a month the museum had an infusion of $253,000 — more than enough to match Clarkson’s bid. Mary Guyatt, curator of the museum, said she had been "stunned by the generosity" of those who had supported the appeal. U.K. Culture Minister Ed Vaizey added: "It's clear from the number of people who gave generously to the campaign just how admired Jane Austen remains to this day." Despite the drama surrounding the Austen ring, Clarkson has maintained a positive attitude. 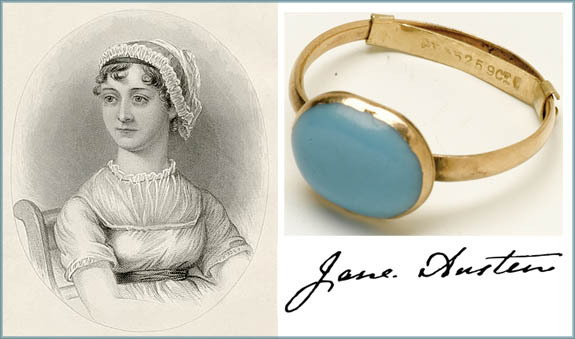 She graciously commented that “the ring is a beautiful national treasure and I am happy to know that so many Jane Austen fans will get to see it at Jane Austen's House Museum." 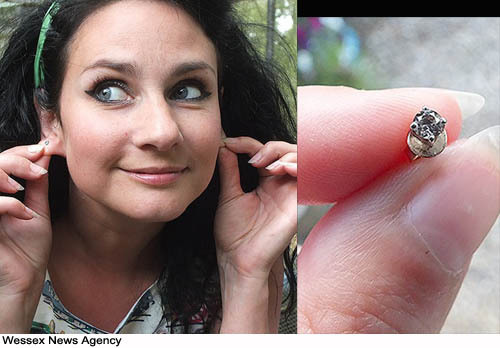 In the meantime, Clarkson is enjoying her exact replica of the Austen ring — a bauble purchased by Clarkson’s fiancé Brandon Blackstock. She’s worn it to many high-profile events, including the most recent U.S. Presidential inauguration in Washington, D.C., where she performed for dignitaries and a national television audience. 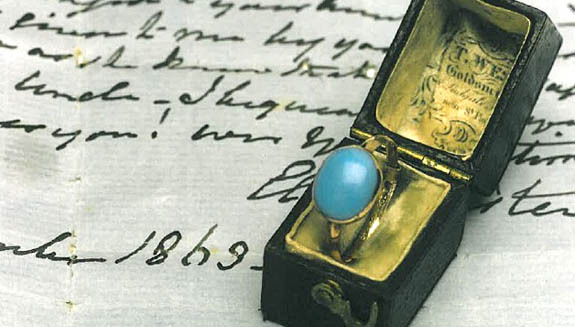 Austen, the author of Pride and Prejudice and five other iconic novels of the early 19th century, died in 1817 at age 41 and left the turquoise ring to her sister; it remained in the family until it was sold at the Sotheby’s auction last year. Decked out in a red Vera Wang mermaid gown and illuminated by emeralds, rubies, sapphires and diamonds worth $7 million, the stunning Sofia Vergara generated the loudest buzz at Sunday night’s 2013 Emmy Awards in Los Angeles. The Modern Family actress collaborated with celebrity jewelry designer Lorraine Schwartz to create a Hollywood glam look that the paparazzi and TV cameras could not resist. Dangling from her earlobes was an irresistible pair of platinum earrings designed in three progressively larger — and varying shape — segments, each trimmed in pavé diamonds. The smallest segment of each earring featured a round ruby, the next an oval sapphire, and the third, a pear-shaped Colombian emerald (a nod to Vergara’s native country). The total weight of the gemstones was 100 carats. On her right hand was 40-carat Colombian emerald and rose-cut diamond ring, and on her left hand was a 21-carat Asscher-cut diamond ring. Some celebrity sites assumed the diamond ring on her left hand was the engagement ring her fiancé, Nick Loeb, gave her last summer. But that assumption was wrong. Her engagement ring is reported to be a 7-carat cushion cut with accent diamonds flanking each side. Although she didn’t win an Emmy for Outstanding Supporting Actress in a Comedy Series, life is still very good for the 41-year-old bride-to-be. Besides starring on a hit TV show, Vergara was recently named the highest-paid actress by Forbes magazine for the second year in a row. The “Pink Star,” a 59.6-carat internally flawless fancy vivid pink diamond, is expected to crush the all-time record for the most valuable diamond ever auctioned when it goes under the gavel at Sotheby’s Geneva on November 13. The incredible gem should fetch at least $60 million. Offered by an unidentified seller, the Pink Star was originally cut from a 132.5-carat rough diamond mined by DeBeers in Africa in 1999. Steinmetz Diamonds formed the diamond into its current oval shape during a cutting and polishing process that took two years to complete. 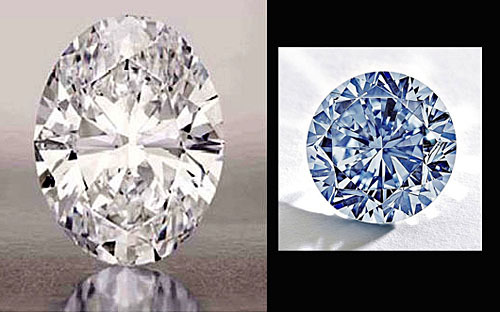 More than 55 percent of the stone’s mass was sacrificed in an effort to attain the most perfect cut, clarity and color. 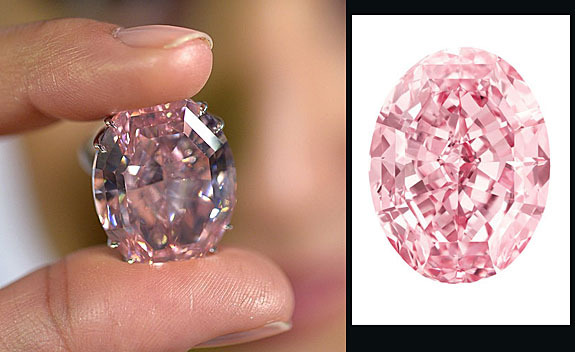 The Pink Star subsequently earned GIA’s highest color and clarity grades for a pink diamond. It has a coveted Type IIA designation, which signifies a high level of chemical purity and optical transparency. David Bennett, chairman of Sotheby's jewelry division in Europe and the Middle East, said the Pink Star is "of immense importance" because of its extraordinary size and exceptionally rich color that surpass all others known to exist in government, royal or private collections. “It is simply off any scale, and passes, I believe, into the ranks of the earth's greatest natural treasures," he said. How far off the scale is the Pink Star? 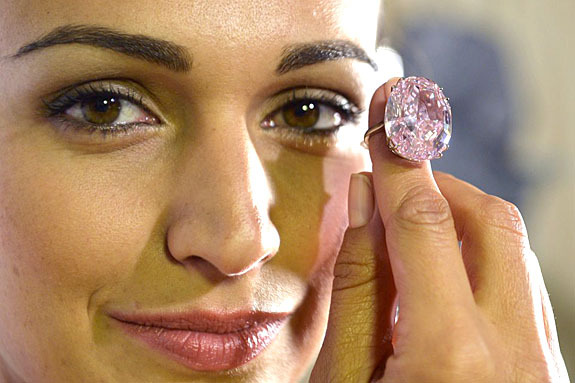 Consider the fact that it is more than twice the size of the “Graff Pink,” a 24.78-carat fancy intense pink diamond, which set the current record when it sold for $45.75 million at Sotheby’s in Geneva in 2010. The Pink Star was originally dubbed “The Steinmetz Pink,” but was renamed after it was sold privately in 2007 for an undisclosed amount. 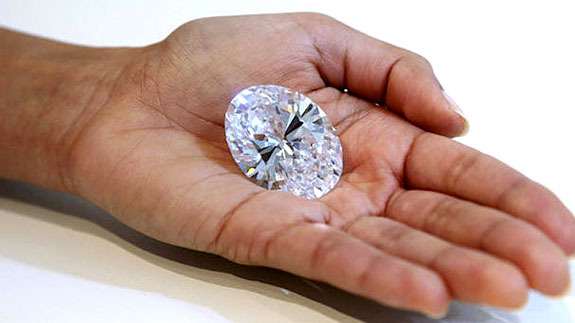 The celebrated diamond will be taking a world tour to promote the Sotheby’s November auction. The Pink Star will be appearing in Hong Kong, New York, London and Zurich before settling in Geneva for the momentous sale. “Postcard From Paris” ascended to #6 on the U.S. Billboard Hot Country Songs chart and got as high as #60 on the Billboard Hot 100 chart. It was the fifth single from the band's blockbuster self-titled debut album, which has sold more than 1.5 million copies to date. Since releasing its debut album in 2010, the sibling trio has become one of country music’s hottest acts. 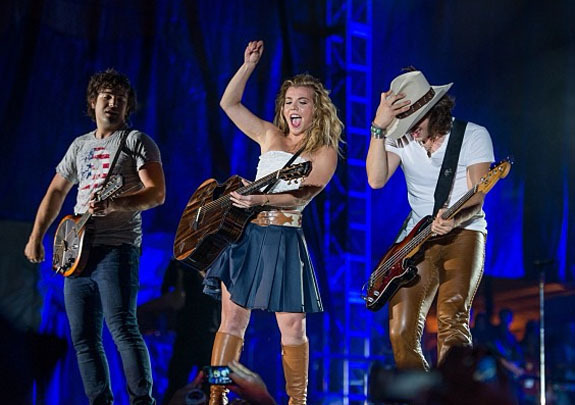 Fronted by Kimberly Perry and rounded out by her younger brothers Neil and Reid, the band notched a string of hit singles, including the quadruple-platinum "If I Die Young,” the platinum "You Lie," and the gold-certified country #1 "All Your Life." They've enjoyed sold-out headlining dates and a showering of music-industry honors, including multiple Academy of Country Music, Country Music Association and Country Music Television awards, as well as Teen Choice, American Music Awards, American Country Awards and Billboard Music Awards nominations. We hope you enjoy the video of The Band Perry’s live performance of “Postcard From Paris.” The lyrics are below if you’d like to sing along. Written by Jeffrey Cohen, Kara Dioguardi, Kimberly Perry, Neil Perry and Reid Perry. Performed by The Band Perry. “Big Bang Theory” star Kaley Cuoco is sporting a brand new 2.5-carat princess-cut diamond ring and "flying high" after accepting the marriage proposal of professional tennis player Ryan Sweeting on Wednesday. The pretty halo-style sparkler features small prong-set round diamonds framing the large center stone. Similar round accent stones are set half-way around the white-metal band. Eonline.com credited Sweeting with picking out the $65,000 ring on his own. News of Wednesday's marriage proposal surprised celebrity watchers, who had first learned of the couple's whirlwind three-month romance only a few days earlier, when Cuoco and her new beau walked the red carpet at the Emmy Awards in Hollywood. Cuoco gave her 1,625,276 Twitter followers a hint of the engagement when she posted this tweet right after accepting Sweeting’s proposal on Wednesday: "Flying high, I could literally touch the sky with you..."
Also on Wednesday, paparazzi spotted the actress wearing what appeared to be a beautiful new engagement ring while out on a coffee run in Sherman Oaks, Calif. At that point her publicist confirmed that the couple was, in fact, engaged. "It's only been three months, but she knows Ryan is the one," a source close to the 27-year-old actress told Us Weekly. "When you know, you just know." Cuocco, who incidentally played junior tennis before giving that up to pursue acting, has starred as Penny on the "Big Bang Theory” since 2007. The 26-year-old Sweeting won the U.S. Men’s Clay Court Championships in 2011 and is currently ranked No. 525 in the world.